The pons is a major division of the brainstem. It is found above the medulla and below the midbrain, and is anterior to (in front of) the cerebellum. Pons is Latin for "bridge"; the structure was given its name by the Italian anatomist Costanzo Varolio, who thought that the most conspicuous portion of the pons resembled a bridge that connected the two cerebellar hemispheres. This part of the pons is now referred to as the basal or basilar pons; not only is it the most distinct area of the pons, it is also one of the more recognizable areas of the brain. Posterior to (behind) the basal pons is an area sometimes called the dorsal pons or pontine tegmentum. Much of this area is also considered part of the reticular formation. The pontine tegmentum includes the tissue between the basal pons and the fourth ventricle; the pons makes up the floor of the fourth ventricle. What is the pons and what does it do? Instead of attempting to identify one overall function (or even a short list of functions) for the pons, it is better to think of the structure as a collection of various tracts and nuclei, all with their own functions. Although describing the pons in this way may make it sound like the pons is involved with a confusing hodgepodge of activities, it is a more accurate approach than attempting to summarize the functions of the pons in just a few actions. The most prominent feature of the pons is the bridge-like portion of it from where its name is derived. 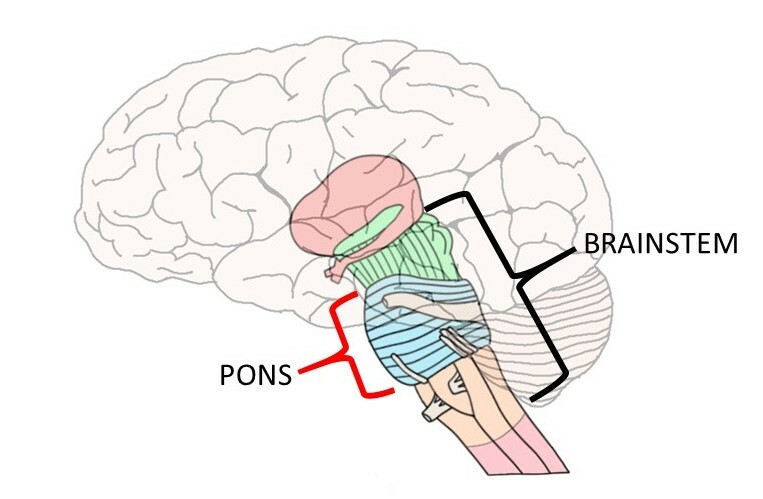 Despite appearing like a bridge, however, the basal pons is not a direct connection between the two cerebellar hemispheres. Instead, fibers that travel down from the cortex (i.e. corticopontine fibers) synapse on a variety of nuclei here called pontine nuclei. Then, groups of fibers project from the pontine nuclei on one side of the pons, cross to the other side of the pons, and come together to form the middle cerebellar peduncles. The middle cerebellar peduncles are large bundles of fibers that connect the pons to the cerebellum, which thus make up the connecting portions of the "bridge." They represent one of the major pathways for information to travel from the brain and brainstem to the cerebellum. Watch this 2-Minute Neuroscience video to learn more about the pons. The pons is home to several cranial nerve nuclei and fibers. These include the main sensory nucleus of the trigeminal nerve and the motor nucleus of the trigeminal nerve---a nerve responsible for sensory and motor functions of the head and face. The abducens nucleus, which controls lateral movements of the eye, is also found in the pons. The facial nucleus, which gives rise to the facial nerve, innervates muscles involved in facial expression and carries sensory information from the mouth. The vestibulocochlear nerve, which carries information about hearing and vestibular senses, enters the brainstem at the junction of the pons and medulla to synapse on various nuclei in these two areas. The pons also contains groups of neurons that are important to major neurotransmitter systems in the brain. For example, the locus coeruleus (Latin for "blue place" and named for the pigment that gives these neurons a blue-black color in unstained brain tissue) is found in the pons. The locus coeruleus is the largest collection of norepinephrine-containing (aka noradrenergic) neurons in the central nervous system. Noradrenergic neurons leave the locus coeruleus and project throughout the brain and spinal cord. Activity in the locus coeruleus is low during sleep and high during states of arousal (e.g. acute stress like a threatening situation). Projections from the locus coeruleus to a nearby region (sometimes called the subcoruleus region) of the pons also help to regulate rapid eye movement (REM) sleep. Indeed, the subcoeruleus region of the pons is considered to be the most critical region for REM sleep in the brain, and damage to this area has been shown to eliminate REM sleep in experimental animals. The raphe nuclei, clusters of cells that contain serotonin, are also found in the pons (and throughout much of the brainstem). Due to its central location between the brain and spinal cord, the pons also serves as a conduit for many tracts passing up and down the brainstem. Tracts like the corticospinal tract for voluntary movement, medial lemniscus for tactile and proprioceptive sensations, and anterolateral system for painful sensations, all pass through the pons. Thus, due to the diversity of tracts and nuclei found within the pons, the structure is involved with a long list of functions ranging from facial expressions to sleep. The pons is therefore not only one of the most visibly distinct parts of the brain due to the bridge-like appearance of the basal pons, it is also one of the most important.